Often, Twitter is just noise. But sometimes, there are really good ideas flitting around! @LeeHasAnxiety recently suggested that there should be an Extreme Makeover: Cubicle Edition. That’s a fantastic idea. Let’s brainstorm what a cubicle makeover would look like. Not one of those “world’s best cubicles” that has mahogany paneling. Keep it real with products that are actually within reach for the average business. Here are some ideas to kick things off using panel extenders. These suggestions are based on the top complaints workers have about cubicles. Cubicle walls are kind of like hemlines – the height changes depending on what’s in fashion. Today’s cubicles feature ultra-low walls that offer as little practical protection as a miniskirt in a blizzard. It’s time for the pendulum to swing in the other direction. Fortunately, you don’t have to replace your cubicle “wardrobe” to accomplish this. 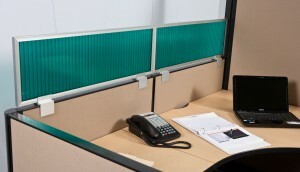 You can tailor each cubicle to the desired height with panel extenders. Working in a cubicle with low walls is just as annoying as living in an apartment with thin walls. Employees really don’t want to know each other that well – they would much rather have some peace and quiet so they can work. Our acoustic tiles feature Soundboard fiberboard covered with textiles made from recycled materials. They block sound about 50% better than non-acoustic panels. Having too much light is just as problematic as having too little. Our semi-translucent polycarbonate panels help employees manage lighting in two ways. First, they can separate workspaces to prevent one worker’s task lamp from casting glare on a coworker’s computer screen. Second, they allow natural lighting to penetrate into the cubicle so there’s not so much gloom. Choose from our library of fabrics, pick a bold polycarbonate hue, or request custom panels in any color of the rainbow. We can add graphics and other design features to your panels to keep the work environment beautiful and interesting. No more dull, gray, featureless cubicles! What cost-effective cubicle makeover tips can you dream up?